Dry Feb is not only a great way to raise funds for the Canadian Cancer Society - it's also a great way to kickstart some healthy habits! Quench your thirst with water or another non-alcoholic drink before drinking alcohol. Space out your drinks about an hour apart. Drink some water along with your alcoholic drink. Avoid salty snacks such as potato chips or nuts while drinking alcohol. Salt makes you thirsty and more likely to drink quickly. Try a shandy (beer with lemon-lime soda or ginger ale) or a wine spritzer (wine with club soda). Do something other than drink or something to slow down drinking when you’re out with friends. Dance or play a game of pool, and drink water while doing these activities. Buy an alcohol measure for when you have a drink at home. You’ll be able to keep track of exactly how much you’re drinking. If you’re a wine drinker, buy small (125mL) glasses for the house rather than large ones. Find other ways to cope with stress. Some people drink alcohol to relax, but alcohol can actually make you feel even more anxious. Try not to make alcohol the only way you wind down at the end of the day. Go for a walk or have a bath with some relaxing music on. Keep track of your drinking habits. To see exactly how much and how often you drink, write down what you drink in a diary. 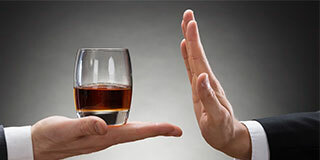 Set reasonable goals – for example, not drinking alone or when stressed. Schedule at least two alcohol-free days each week. You’re more likely to be successful with goals like this than you are if you try to cut out all alcohol immediately.